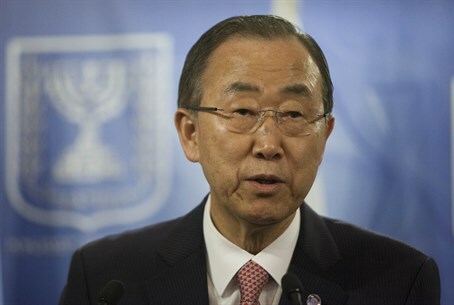 Ban Ki-moon calls on Israel and PA to resume peace talks, predicts the “momentum” of countries recognizing “Palestine” will grow. United Nations Secretary-General Ban Ki-moon predicted on Monday that the “momentum” of countries recognizing the “state of Palestine” will grow. Ban, who spoke before a UN committee on Palestinian rights, urged Israel and the Palestinian Authority to "step back from the brink" and return to peace talks. "The Israeli and Palestinian people face a shared fate on shared land. There is no erasing the other," Ban said, according to the AFP news agency. "Governments and parliaments are taking action. That momentum will grow," said Ban, referring to recent moves by governments in Europe to recognize “Palestine”. Last week, Spanish lawmakers adopted a motion calling on the government to recognize a Palestinian state, and France has announced an upcoming vote on the matter as well. "We, as the international community, must assume responsibility for what is a collective failure to advance a political solution for the Israeli-Palestinian conflict," said Ban, according to AFP. "The mindless cycle of destruction must end. The virtuous circle of peace must begin."